Sharing your life with a dog is one of the most rewarding things you can do. He will give you love and undying loyalty, make you laugh and keep you fit. The bond between an owner and a dog can be stronger than any human to human bond. Also, for many people their dog is simply another family member whose needs are equal to its human members. Dogs are sociable animals and should not be left alone for hours on end. Someone who is at work all day should not choose a dog as a pet. Dogs need exercise every day. If you are not prepared to take a dog out for a walk in all weathers, you shouldn’t have one. A dog owner should pick up their dog’s poo. Are you happy to do that? 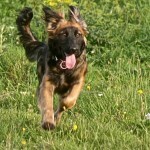 Dogs need mental as well as physical stimulation. They enjoy training, interactive play, and agility-type activities. Are you prepared to cater for your dog’s need for mental stimulation? Dogs are expensive. On top of the cost of buying a dog, there is the cost of food, toys, bedding, etc. If your dog becomes ill, it is your responsibility to seek veterinary treatment and vet bills can easily run into hundreds if not thousands of pounds. What will you do with your dog when you go on holiday? If you like to travel abroad you may need to pay someone to look after your dog while you are away. Like humans, dogs need love, respect, security and physical contact. If you cannot love a dog there would be little point in having one. Never think of a dog as a fashion accessory or toy (as strange as it may sound, some people do). Even the smallest breed of dog is still a dog and should be treated as one. If you’ve thought of all these things and can provide a dog with its needs, you are ready to take on the commitment of dog ownership. In return, your dog will reward you with his joy for life, affection and loyalty.